"Purple yams are tossed in sriracha salt and olive oil then air-fried until crispy. 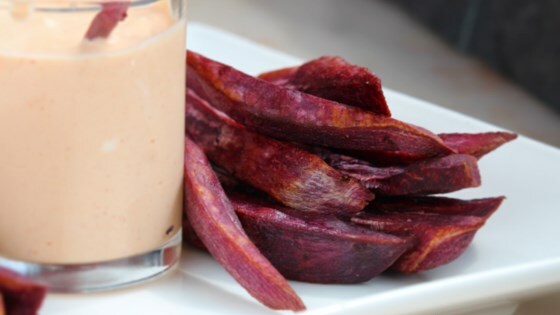 A simple combination of cool sour cream and sriracha complements the sweet yam. The procedure for cooking yams in an air fryer is different than cooking potatoes." Preheat an air fryer to 320 degrees F (160 degrees C). Place yam fries into a bowl. Add olive oil and sriracha-flavored salt; toss to coat evenly. Pour into the air fryer basket. Cook in the preheated air fryer for 16 minutes. Increase heat to 400 degrees F (200 degrees C). Shake basket and cook for 5 minutes more. Mix sour cream and sriracha sauce together in a bowl. Serve alongside yam fries. You can cut yams with a French fry cutter instead of a knife if preferred.